Does Velociraptor fossil suggest dinos had feathers? From Turner et al., ref. 1. They found six small bumps in the central third of the bone which they interpreted as quill knobs, which provides their ‘direct evidence’ for feathers. However, no actual feathers were found, so this is an inference based on apparent similarity of the bone structure to some birds. What of the quill knobs? The images in the article do not do justice to the significance the researchers put on their find (figure 1). This may just be a problem with the images. However, in contrast to clear quill knobs on the turkey vulture ulna shown for comparison, the ‘quill knobs’ on the Velociraptor bone are rather inconspicuous even in the magnified image.2 One must wonder if these quill knobs are really quill knobs at all. The specimen these claims are based on, IGM (Geological Institute of Mongolia) 100/981, appears to be nothing more than a single ulna bone. Turner et al. say that it ‘possesses several characteristics’ normally found in Velociraptor mongoliensis and that it was found in rocks that have produced other Velociraptor specimens. However, their whole case rests on this one bone. Taxonomic misidentification is always a possibility when all that was found was one bone. Another important point is that quill knobs are usually evidence of secondary feathers used for flight. However, nobody believes that velociraptors could fly. This suggests the bumps may have a different function than anchoring feathers. The evidence presented is hardly enough to make a definitive claim for the existence of ‘feathered dinosaurs’. Evolutionists thus have to postulate at least 70 million years of ‘evolutionary stasis’ for this fossil to have any significance for bird evolution. And what’s more, there isn’t a shred of fossil evidence to place velociraptors (or any other ‘feathered dinosaur’ found to date) before Archaeopteryx. (See Plucking the dinobird). This Velociraptor fossil (like the others) is too late according to the evolutionists’ own dating scheme to have any bearing on their own bird evolution stories. Thus, this Velociraptor fossil (like the others) is too late according to the evolutionists’ own dating scheme to have any bearing on their own bird evolution stories. National Geographic reported an interesting comment from Alan Turner, the principal author of the Science paper; ‘If people saw this animal now, they would think it’s a really strange-looking bird.’4 If we assume this bone did have quill knobs and feathers, and it was a Velociraptor, what’s stopping it being a flightless bird? Even if it were a true feathered dinosaur, what’s to stop God from having created feathered dinosaurs as separate creatures? You may notice I’ve suggested several completely different interpretations of the evidence in this article. This raises perhaps the biggest problem in paleontology—the scarcity of the evidence. In the light of such a small amount of evidence one can hardly be expected to hold to any interpretation with any sort of certainty. This has not stopped evolutionists from announcing the evidence with all boldness and claiming it as another grand triumph for orthodox dino-to-bird evolution. And all this on the ‘rock solid’ basis of one arm bone with a few bumps? Turner, A.H., Makovicky, P.J. and Norell, M.A., Feather quill knobs in the dinosaur Velociraptor, Science 317:1721, 21 September 2007. Return to Text. 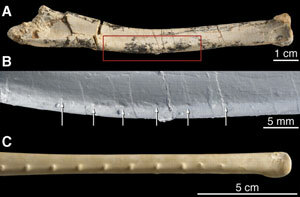 There is an image of an ulna from a Shearwater Puffinus in the supplementary information of ref. 1, which shows considerably smaller quill knobs than the turkey vulture. However, the quill knobs are still readily identifiable on the puffin bone all the way along the bone. Return to Text. Woodmorappe, J., Bird evolution: discontinuities and reversals, Journal of Creation 17(1):88–94, 2003. Return to Text. Luvgren, S., Jurassic Park raptors had feathers, fossil suggests, National Geographic News, 20 September 2007. Return to Text.